Last weekend we rented a car and headed an hour north of Toronto to Barrie, which sits on the western shores of Lake Simcoe. We didn’t visit for the lake though, we were there for the ski hills and to partake in a spot of snow tubing. For those who don’t know, snow tubing is where you sit in a giant rubber ring and slide down a snowy hill. It’s popular because it’s lots of fun and doesn’t require any skills, other than the ability to sit in the ring without your bum touching the snow! After the warmer weather there’s very little snow left in Toronto but according to the resort webcams there was still plenty of snow up in Barrie so off we went. As we travelled further and further north we got worried about the lack of snow, but by the time we reached Barrie the fields had started to turn white again. 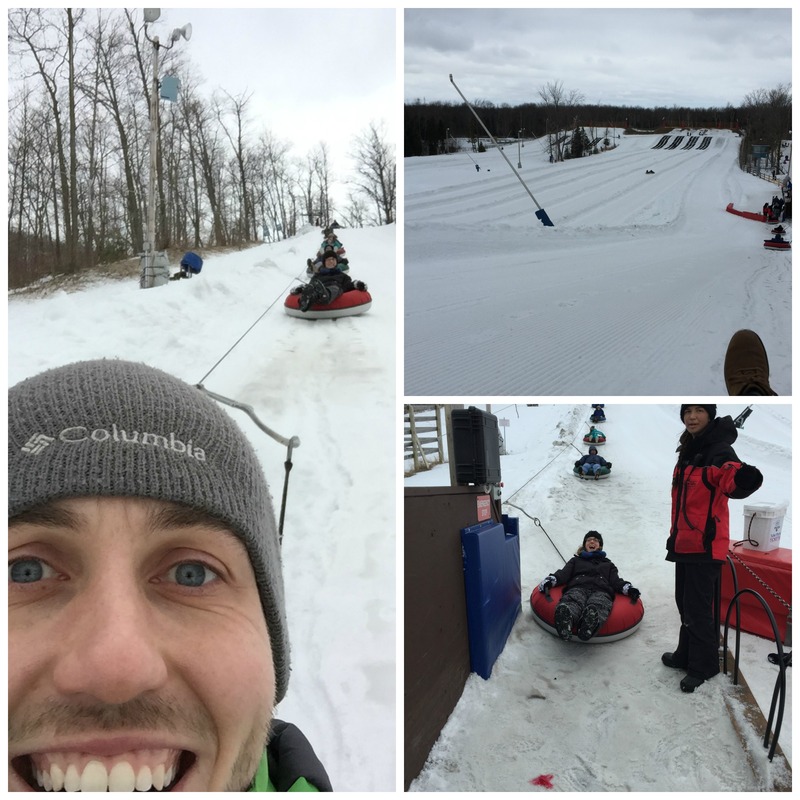 There are a couple of places in Barrie which offer snow tubing and we weren’t sure which one to go. 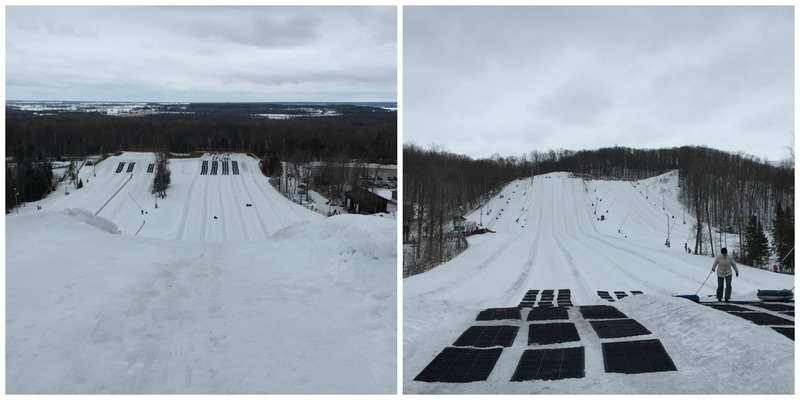 Snow Valley claimed to offer the ‘best snow tubing in Ontario’, so naturally we decided to start our day there. The first thing we noticed when we got out of the car was how much colder it was here than in Toronto, which explains why there was still so much snow… In the absence of owning any ski pants, Stewart improvised by wearing my waterproof trousers over the top of his jeans, which did the job and meant he didn’t stand out as the idiot wearing jeans. It was a pretty grey morning in Barrie, I imagine you can get a pretty good view from the top on a clear day. The second thing we noticed was just how steep and high the snow tubing chutes were, which of course meant we went down very fast and saw several people lose their hats on the way! It was a lot of fun, especially being able to hold onto each others tubes so that we could go down together. Up to 5 people, in separate tubes, holding on to each other could go down at anyone time so it would be a great group activity. There was no chance we were going to be able to film ourselves sliding down without having the camera securely strapped to us, so you’ll just have to make do with this video footage of us instead. Also on YouTube here. Since we loved the first snow tubing so much and we still had some time to spend with the rental car, we decided to drive the short distance to Horseshoe Resort to see what that was like. This was clearly where the sun had been hiding and it was considerably warmer. It was also a much bigger resort, with lots more ski runs and plenty of other activities going on. We found the sun at Horseshoe resort, you can also see the brown patches at the bottom where the snow is disappearing. The snow tubing chutes here were a lot smaller, and therefore slower, but still fast and we enjoyed zooming down in various different combinations. Since they were slower and there were less rules in place, we also risked filming ourselves, as you can see from the video below, or on YouTube here. So which one was better? 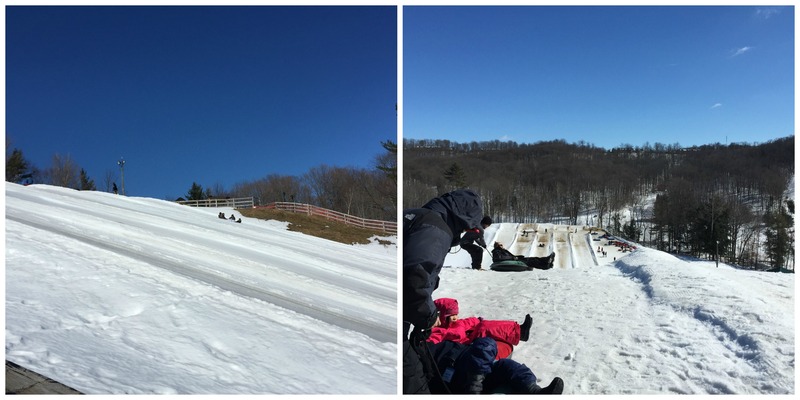 Hands down Snow Valley – the tubing was just so much faster. It was also a lot quieter meaning we didn’t have to wait as long to get up and down the hill, but that could have been due to the weather. Either way, we would definitely recommend snow tubing at both places! We’ve since found this excellent footage from fellow blogger Will on his recent trip to Valcartier in Quebec City. The snow tubing here looks absolutely amazing with several much more extreme slides, definitely one for next winter! At Snow Valley, we paid $40 for 10 rides between us. Meanwhile, at Horseshoe Resort we paid $34 for 8 rides between us. Both locations offer a variety of different packages, so you can cater for your budget and time restrictions. Anything from 1 ride (who’d only want 1 ride!?) up to 60 are available depending on where you go. Horseshoe Resort offers a 2 hour pass for $20 per person, which we were informed would allow for 6-8 rides. OMG. Valcartier has to happen! That looks incredible! Barrie one of my favourite haunts in Ontario…..loved seeing your videos of the tubing…. 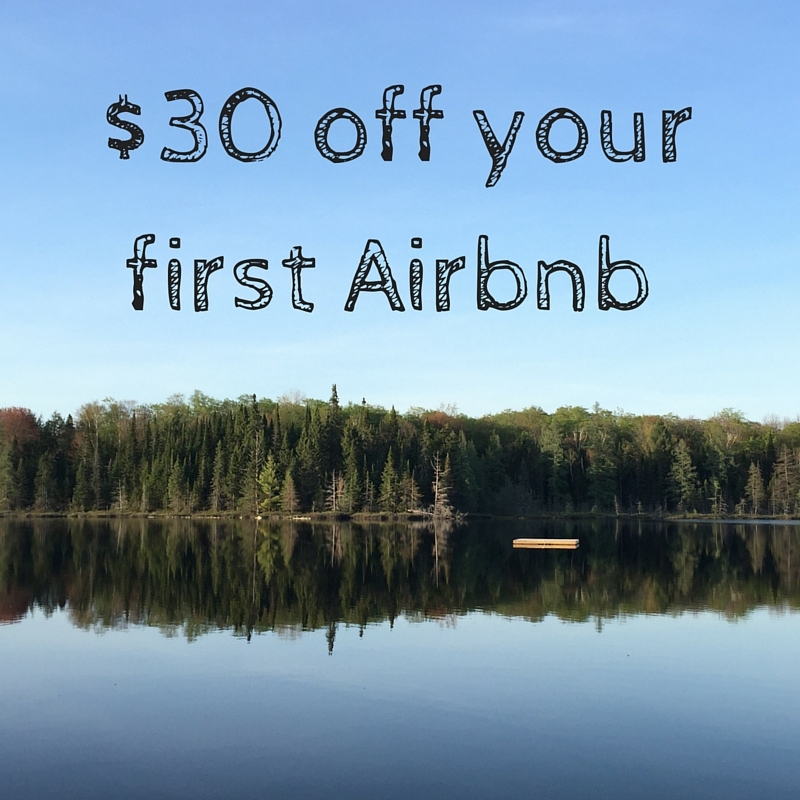 I know – we have to go to Valcartier next winter! Glad you liked the videos 🙂 is there anything else you’d recommend seeing or doing in Barrie? Horseshoe Resort has Treetop Trekking (aerial park). And of course….the shopping! Haha glad you enjoyed it. I will make sure there is more in the future for you, I think we might have to buy a GoPro! It’s wonderful to see you two experience Canada this way! Val-Cartier is a must along with the Quebec Winter Carnival! Hey guys! Thanks so much for the shout out 🙂 Valcartier was definitely the CRAZIEST tubing I’ve ever done. I actually went to Horseshoe after and I noticed a big difference in “thrill” level. That being said, it’s still a ton of fun out there. They love doing the crazy spin when coming down. We also discovered that if you link up in groups of 5+ it can be a lot of fun as well. 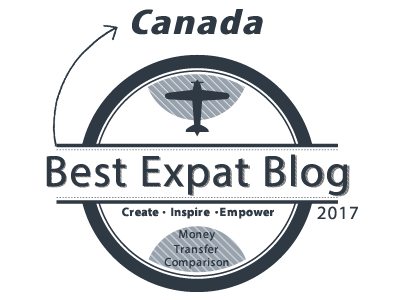 No problem, we love your blog and can’t wait to visit Valcartier next winter. I have to agree that going down in groups at Horseshoe looked like so much fun. Stewart loved the spinning too but it made me feel a bit queasy! Wow! 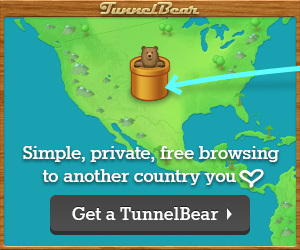 I didn’t even know this existed. Sure beats sliding down snow banks in my father’s driveway when I was a kid. 😛 Nice meeting you both at Travel Massive last night by the way! Lovely to meet you too. Can’t believe you didn’t know about snow tubing, you should definitely give it a go next winter, it was so much fun!